Showbiz Pizza Place was the Pepsi to Chuck E. Cheese’s Coke. The video game pizza parlor boasted a superior band with the Rockafire Explosion and an inferior everything else. Chuck eventually absorbed Showbiz to create a grand unified theory of mediocre food and semi-operational robotics, but before that happened they were engaged in a brutal war to get you, your family, and your softball coach’s quarters. We’ve all wondered whether we had what it took to be a Showbiz Pizza staff member, and it’s time to get some answers to that question with these training videos. 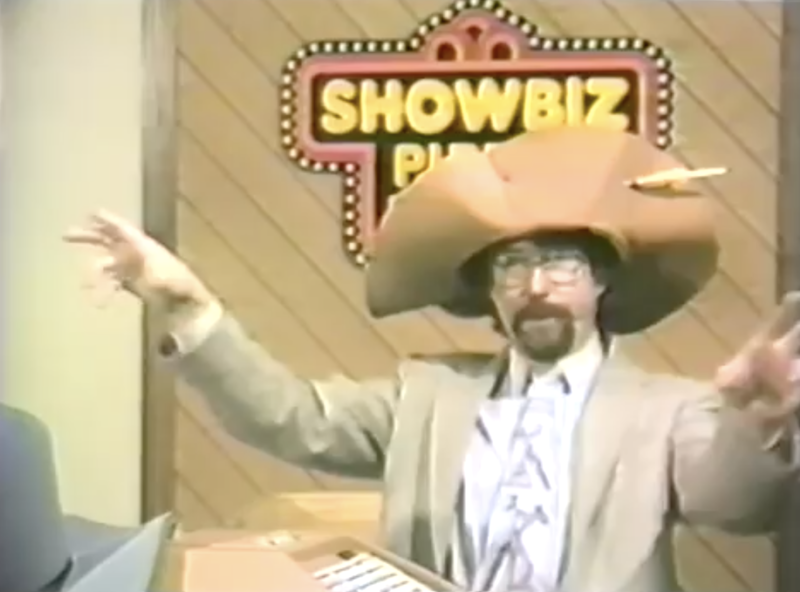 This 1981 video, Operation: Promotion explores the role of the Showbiz Program Director, that lucky person responsible for arranging in-restaurant events and out-in-the-world promotions. She also dresses in a ridiculous white outfit and top hat that she wears even when she’s by herself, in her office, on the phone. She’s the one who drags an in-costume Billy Bob to every car dealership or gas station opening within a ten mile radius. I’m pretty sure, however, that BiIlly Bob doesn’t ride to these things in-costume on the back of a motorcycle. Exhausting job, that of the Program Director. Probably 90% of Showbiz’ business had to have been birthday parties. Here’s a stiff, poorly produced video with mono audio that trains employees on…how to answer the phone to book a party. A whole video for this? A jester and a clown at your birthday party, and the “surprise” is a hug from Billy Bob? This arrangment makes no sense. The sloppy production on this video makes Operation: Promotion come off like Citizen Kane. It’s hard to know what to make of this one, Operation: Entertainment. It’s a stream of consciousness riff on generally how to be “fun” as a waiter at Showbiz Pizza. One take, one set, 8 minutes, aimed at people who were determined to be in need of fun lessons. I can’t tell if he’s an employee of Showbiz Corporate or just some local comedian hired to riff. Either way, it’s something special. I think we’re all fully trained Showbiz employees at this point. See you at work tomorrow. And thanks, Brenda, for washing the uniform every night.